I am an Agnostic and have been one for as long as I can remember. Yes, you read that right. But before you start getting any ideas, allow me to clear for you a few things. According to Merriam-Webster’s dictionary, an Agnostic is defined as: “A person who holds the view that any ultimate reality (as God) is unknown and probably unknowable; broadly: one who is not committed to believing in either the existence or the nonexistence of God or a God.” Yes, I undertook the arduous Char Dham Yatra and now I am writing about it. Not that they attest your beliefs before letting you pass, and absolutely not asserting that only the ‘faithful’ have the right to be on this journey. For me, the entire ordeal was to walk it off, travel it out, to be in places where nature existed in its pristine form (which it still does, mostly) before people put Gods there. And while I often write about the myths, legends and beliefs concerning related places in the Himalaya, I am merely channelling information rather than admitting what beliefs I hold. However, this time I will, because I have thing to say. I will because this devotion, very neatly, is setting up the pieces for destruction. I will because we’re all playing fast and loose with what we proudly call ‘faith’. Not all ‘faithful’ are culprits. Not all ‘faithless’ are innocents. Absolutely! The Char Dham Yatra is undoubtedly one of the most religiously charged, transformational pilgrimages in India. But it’s definitely the one, I happened to reaffirm my opinion in the first two days, where the doubters and the faithless confirmed wisdom and order has little to do with which God you worship. You can be religiously or spiritually inclined but if you happen to lack a certain amount of common sense, a genuine regard for Mother Earth and an inherent knack to treat others as equals, then this journey to move closer to God and yourself is and ever will be, an epic fail. Faith that throws caution to the wind invites the storm. The fact of the matter is what we are putting out there is a lot more than what we are taking back home. Just what are we putting out there: long traffic snarls, diesel fumes, relentless honking, angry glares, vile words, blatant carelessness, river pollution, plastic waste and other, caste-shaming and judgement thereof, family feuds, bruised egos, battered prides, broken relations, impatience, elbow-bumps, rush and businesses made out of anything and everything? All this complaining while taking on what is supposed to be a pious affair. And just what are we taking back home: a handful of moments amidst nature and a whole lot of forgettable memories of a haphazard journey? The Char Dham Yatra, what it is known for in the ancient of texts, stopped being that long before we hit the next millennium. And the storm is coming! We may fool others for a lifetime but we cannot fool nature for even a second or take it for granted. It’s one thing that’s fair and consistent and is watching closely. Whatever we are putting out there, physical waste or emotional, nature is accumulating all of that quietly. And know that it will only measure everything in black and white, not greys. In actions, not intent. It will find a way to get even with the atrocities committed against it. In more catastrophes, like the one that hit Kedarnath five years ago, I’m afraid. If this is what reckless faith does to the world we live in, then maybe we’re all better off without it. An avalanche below peak next to Kedarnath. Never in my wildest dreams did I see myself being a part of the Char Dham Yatra in the month of May or June, the peak season. I’ve always fancied October when the woes are less and people, a lot more sensible and calm. This was purely by chance and a decision I had to take the very last minute. And I’m partially glad that I did. Maybe there’s, in fact, something about us assembled in thousands and millions at the same time at the same place that makes us just lose it altogether. Nonetheless, here’s an account of what happened through. Things at the Yamunotri Dham are terribly mismanaged. While the 6 km trail is in good shape, paved throughout and grilled at the boundaries, there is just not enough space for all―foot pilgrims, ponies, palki walas (Palanquin carriers) and pitthus―to walk on it together. I, along with many others, got stuck in a human and pony traffic jam for about 2 hours on my way back. Utter standstill. Expletives and elbows were exchanged as lovingly as the prasad. Devotion devoid of good decency is no devotion at all. However, if you still want to visit, then plan your stay at the Shiv Shakti Eco Resort in Kharsali. It’s not only away from all the clutter but gives you a beautiful view of the township and river Yamuna below, and the snow-capped Himalaya right in front, including Bandarpoonch on the right. The rooms are fairly spacious, considering most of the other options are huddled together with little or no breathing space. The food is good and homely. And the trek to the temple is less than 7 km from here. We started the trek (7 kilometres) at around 9 in the morning together, but I was back by 4. It would have been less time consuming if not for the human-animal jam. It took us about 12 hours to reach Janki Chatti from Haridwar. Yamunotri Temple and River Yamuna below. Polluted! When you set out for Gangotri from Uttarkashi, the scenery starts changing, right after Bhatwari, gradually, towards the dramatic. And it is at its beautiful best when you hit Harsil and further. A few of the prominent peaks of the Himalaya and some subsidiary ones, start making appearances as you gain altitude. Pines and Deodar, wide-open valleys, and the gushing Bhagirathi river keep you company throughout. It is, in all fairness, probably the most scenic drive of the entire Char Dham stretch. We broke our journey at Uttarkashi and it is advised you do the same if you don’t have a hotel booked near the temple. Either they’ll give you at escalated rates or it may not be available at all. In peak season, that is. Also, if you’ve been keeping a tab on my Instagram posts, a few mentioned how we are polluting the river at its source, looking at the colour of the water and the clothing floating on the surface, when I shared a few seconds of footage a few days ago. Please know that the colour is so because of the silt it carries with it. As far as the devotees offering stoles and sarees to the mother Goddess is concerned, the practice should definitely be discouraged. There’s a whole not of India in this picture. Gangotri Temple. I think I always had it in my subconscious that someday I’ll be a part of modern-day Exodus. And when I hit this trek, all the visuals started coming back to me. The plight of people from all strata of the society: pilgrims, vacationers, an odd trekker and a few nature lovers. While some opted to walk, others were more comfortable flying (the chopper), but all heading in the same direction, just not at the same point. 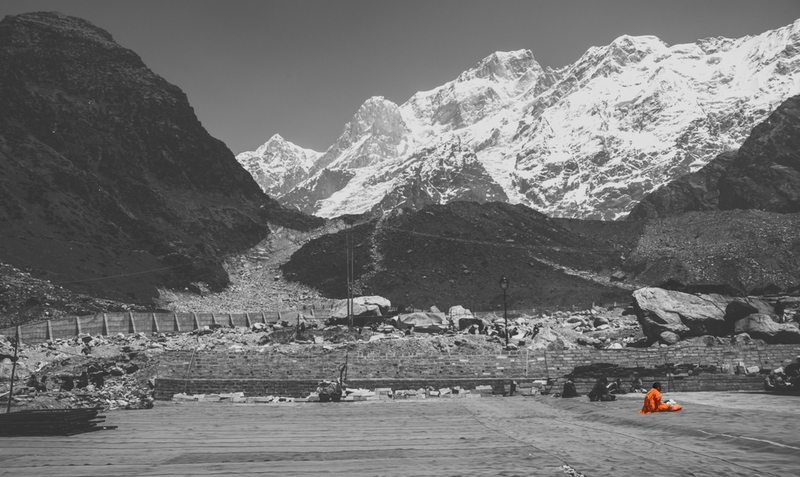 In a few days from now, it will be 5 years since the catastrophe hit Kedarnath. The flash floods that killed in thousands as the holy river Mandakini broke all confines. The devotion is only growing stronger each year. But as I said, faith that throws caution to the wind invites the storm. Increasing footfalls and zero accountability has all the makings of another disaster, on a whole new level. Moving on, we started the trek at around 2 am from Gaurikund and were back by 5 pm. 15 hours in total, out of which 4 hours were spent waiting outside the temple in an almost kilometre-long queue for the darshan. The trek is 32 kilometres, Gaurikund to Gaurikund. The path is well-lit, shall you plan to start at the same time. There are plenty of shacks on the way, and even at this hour, some are open. Drinking water (for refill) is available at many places. And so are little rooms and tents in case you feel the need to break your journey. All in all, things were managed slightly better by the respective authorities here than in Yamunotri. The queue outside Kedarnath Temple. This is beyond any of us! Whether it’s the traffic, parking, accommodation or the queues at the temple, I found Badrinath to be the most sincerely and efficiently managed Dhams of the four. The results were evident. And even though dustbins are far and few between, the streets were almost litter-free. A pat to the pilgrims, the authorities and the locals for keeping it that way! As opposed to Kedarnath which, agreed, is far larger in scope, is littered to the extreme even though there are dustbins placed at every few metres. Since the queue moved fast, there was some time left to just about get the feel of India’s Last Village in this region – Mana, 3 kilometres from Badrinath. Some of the best memories while travelling are made up of quiet walks with no agendas. And that’s how we explored this beautiful village with whatever time we had. I don’t think the Himalaya look as godly as they look here in Mana, capable of brining you to your knees. Such is their power that you almost feel like surrendering. River Saraswati that secretly emerges from beneath the mountains is a sheer force, raw and powerful. Badrinath Temple. The most efficiently managed of the four. Please know that it takes years to reverse the damage caused in just two months. But we keep barging in, year after year, with growing numbers, and larger woes. I hope this write-up is taken in the spirit it is intended and not in any other way. Do drop in a comment if you feel a debate is needed. Travel safe, travel wise, travel responsibly. I’ll leave you with a few pictures till then. See you soon! Morning view from Shiv Shakti Eco Resort. Yamunotri. View of Janki Chatti, the starting point of the Yamunotri trek, after evening showers of rain and hail. And just below is a pile of neatly lined up buses and other vehicles small and big. Just saying! Yamunotri. After rain and hail. Yamunotri. A few kilometres before Gangotri. Look at the scope of it. By the banks of River Bhagirathi. Gangotri. The plight of people. Kedarnath. Reflections of a heavenly kind. one of my favourite shots from the Kedarnath Trek. One usually doesn’t get reflection shots during this trek but it had snowed just a few days ago. While it all melted away by the time we reached, this puddle remained. Thank heavens, it wasn’t that windy and the sky, crystal clear. Let me know in the comments what you think of it. In frame, left to right, Bharte Kunte, Rock Tower and Kedarnath Peak. Alaknanda river and the premises nearby the temple. Badrinath. Badrinath Temple seen from a distance. The otherworldly Mana village. 3 kilometres from Badrinath. It is the last village in India in this region. I wrote this post in collaboration with Terrain Troopers, an Uttarakhand based touring and trekking company. The views and the pictures expressed are mine. I have gone through your blog and trust me I found that immense pleasure and peace as if I experienced the whole thing in the journey….. Thanks for showing us that real image and discovering new things while just reading… God bless…. And hope to come up with more new blogs.. Thankyou. Thanks for sharing the valuable information about this Chardham Yatra. Very few lucky ones get a chance to visit these. It is very helpful information about the Chardham Yatra. We are looking forward to welcoming you soon again to our Hotel! Thank you, Neeraj ji. Looking forward to being there again.